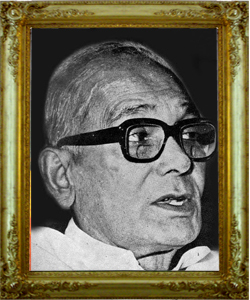 Jayaprakash Narayan was a freedom fighter and political leader of India. Popularly called JP, Narayan played a pivotal role in the Quit India movement and earned a lot of fame and respect for this. During the Quit India Movement too in 1942, JP was at the helm of the agitation. In 1922, Narayan went to the United States, where he worked to support his studies in political science, sociology and economics at theUniversity of California, Berkeley, University of Iowa, University of Wisconsin–Madison and Ohio State University. He adopted Marxismwhile studying at the University of Wisconsin–Madison under sociologist Edward A. Ross; he was also deeply influenced by the writings of M. N. Roy. After returning to India, Narayan joined the Indian National Congress on the invitation of Jawaharlal Nehru in 1929; M. K. Gandhi became his mentor in the Congress. During the Indian independence movement he was arrested, jailed, and tortured several times by the British. He won particular fame during the Quit India movement. After his release in 1932 for civil disobedience against British rule, the Congress Socialist Party, or (CSP), a left-wing group within the Congress, was formed with Acharya Narendra Deva as President and Narayan as General secretary. On April 19, 1954, Narayan announced in Gaya that he was dedicating his life (Jeevandan) toVinoba Bhave's Sarvodaya movement and its Bhoodan campaign, which promoted distributing land to Harijans (untouchables). He gave up his land, set up an ashram in Hazaribagh, and worked towards uplifting the village. Narayan returned to prominence in State politics in the late 1960s. In 1974, he led the student's movement in the state of Bihar which gradually developed into a popular people's movement known as the Bihar movement. It was during this movement that JP gave a call for peaceful Total Revolution Together with V. M. Tarkunde, he founded the Citizens for Democracy in 1974 and the People's Union for Civil Liberties in 1976, both NGOs, to uphold and defend civil liberties. Narayan also wrote several books, notably Reconstruction of Indian Polity. A university (J P University in Chhapra, Bihar) and two Hospitals (L N J P Hospital in New Delhi and Jai Prabha Hospital in Patna) have been opened in his memory. The capital's largest and best-equipped trauma centre, the Jai Prakash Narayan Apex Trauma Centre of the All India Institute of Medical Sciences, also honors his contributions.